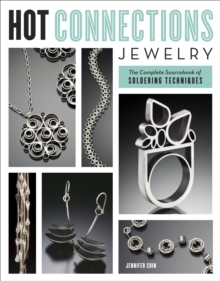 This title is suitable for jewellery makers who have had some experience with beading, wire-working and basic cold-connection techniques (such as riveting) and are ready to move on to the next level and add a core metalworking skill to their creative repertoire. Jewellery designer Jennifer Chin offers detailed instruction in the materials and techniques of soldering, supported by a series of lessons and progressive projects inspired by her stunning jewellery designs. The result is a solid reference comprising a series of progressive lessons that give readers a foundation for learning and expanding on new skills, along with gorgeous projects and gallery pieces that inspire them to move on to subsequent lessons.